The Community Council meets on the third Thursday of every month at 6.30pm in Cwmllynfell Hall, unless otherwise stated. The agenda for the meeting will be posted 5 days before the meeting and the latest agenda can be found here. Residents can contact the clerk if they are concerned about an issue in their area and they would like it to be considered to be placed on the agenda for discussion. Members of the public are also welcome to attend and observe all meetings of Council. 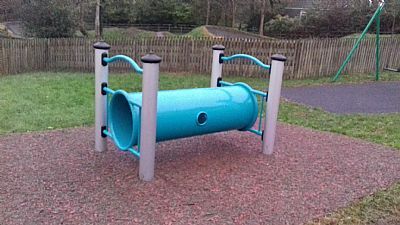 Cwmllynfell Community Council is delighted to announce that the the play park in Rhiwfawr now has the new and exciting play equipment installed. 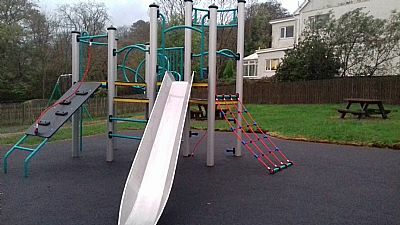 The design of the new play equipment was chosen by children who live and play in the village of Rhiwfawr through consultations that were held in February. A total of £21,678 of funding was secured through two successful grant applications to WREN’s FCC Community Action Fund and Neath Port Talbot County Borough Council East Pit Opencast Community Benefit Fund. WREN is a not-for-profit business that awards grants for community projects from funds donated by FCC Environment through the Landfill Communities Fund. Celtic Energy established, in conjunction with Neath Port Talbot Council, the East Pit Opencast Community Benefit Fund to support those communities most affected by the East Pit Opencast works. The field in Rhiwfawr still remains closed due to the drainage works however it is hoped that these will be completed in the next couple of months. Everyone is reminded that until further notice the field is closed and out of bounds except for authorised personnel. The Council is sorry for the inconvenience this has caused to date and is working with the contractors to get matters resolved as soon as possible. The East Pit Community Benefit Fund Scheme is still open for applications from groups that provide benefits for people living in the Cwmllynfell and Rhiwfawr wards. Application forms and grant guidelines can be found in the Library pages in the Community Benefit Scheme folder. All future applications will now be dealt with at the Council meetings. The deadline for all End of Grant Forms is Thursday 8th March 2018. Cwmllynfell RFC £2,000.00 Repair to external rendering. Please note that the small grant scheme operated by the Community Council has been suspended for one year. On the 11th November 2016 the community defibrillators were officially launched at both Cwmllynfell Hall and Rhiwfawr Hall. The defibrillators are available for use by members of the public and / or staff in the event of a sudden cardiac arrest. If you would be interested in receiving training in how the defibrillators work then please contact the Clerk.